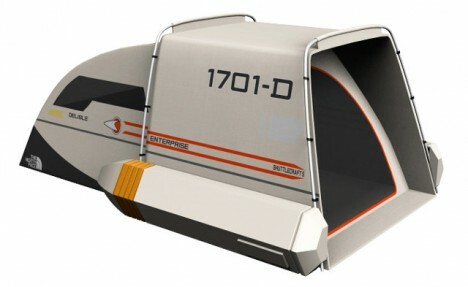 If you are planning a trip to the final frontier, be sure to pack well and always carry your own Star Trek shuttlecraft tent. 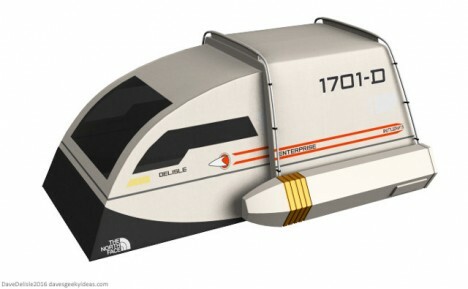 This Federation-inspired shuttle sleeper, designed by Dave Delisle, features side thrusters that conveniently allow you to pack up your pop-up pod and carry it anywhere. Perfect for away missions and stowing on larger aircraft. Space (or forest or park) exploration aside, this would be a great kids playroom or backyard tent for domestic overnights and sleepover parties. The shuttle-as-sleeper also works well with the elements from the series/movies, affording one windows just where they would be in space, and a frame that wraps in a natural way around the hull. Alas, for now this is merely a conceptual design, so unless the powers that be in the Star Trek cinematic universe adopt or back the project, it may not arrive until stardate -298550.2563689031. See more in Gaming & Geek or under Gadgets. June, 2016.